Ahh… the comforts of home! At approx. 390 sq ft., this one bedroom suite is spacious and designed for comfort. The suite features a Queen Bed in the bedroom, a living room with a sofa bed and sitting area. A Full Kitchen with Refrigerator, Cooktop Stove, Microwave and Kitchen Amenities makes this studio room ideal for longer stays or for those who like to create their own culinary masterpieces. Other highlights include: TV in each room, High-Speed Internet, Air Conditioning, Free Local Calls, Iron/ Ironing Board, and a Coffee Maker. Cribs are available for all rooms upon request and availability at time of reservation. 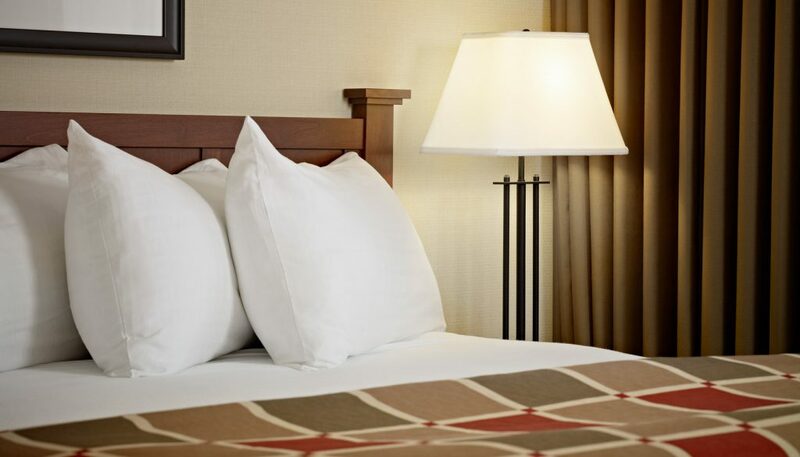 Like our other room types, the one bedroom suites include free high-speed Wi-Fi, free parking, free HD TV and a delicious free hot breakfast buffet daily.